Catalyzed by the President’s Cairo speech, nearly 10,000 entrepreneurs, investors, foundations, and other key stakeholders have since convened over the past six years in Washington, Istanbul, Dubai, Kuala Lumpur, Marrakesh, and Nairobi as part of a series of entrepreneurship summits. Later this month, President Obama will lead the U.S. delegation to join approximately 1,200 more entrepreneurs, investors, and mentors from 170 countries in Silicon Valley for the seventh and final Global Entrepreneurship Summit (GES) of the Obama administration. As the Department of State’s Special Representative for Commercial and Business Affairs, I have had the privilege of travelling across the globe as part of a series of “Road to GES” events. The purpose of the events has been to promote GES 2016 and entrepreneurship more broadly for three reasons. Promoting entrepreneurship creates jobs and incomes. By creating such prosperity, enhanced stability follows, diminishing extremism and associated security threats. So does a level playing field and inclusiveness where entrepreneurs can be self-reliant and contribute to their economies and societies. From Beijing to Berlin, Telangana to Tunis, I have seen firsthand how GES has sparked the creativity and captured the imagination of entrepreneurs world-wide, and how they are transforming their societies. Take the entrepreneur I met in India who was working to develop durable solar powered roofs that don’t just provide shelter but also can charge light bulbs. In a country where a population the size of the entire United States has no electricity, such bottom up ingenuity to complement the government’s top down policies is essential. Another in Tunisia described his passion for entrepreneurship as the idea of achieving “success without unfair advantage.” Creating a strong and self-starting entrepreneurial ecosystem was, in his view, vital to cementing Tunisia’s historic democratic transition away from the prior authoritarian regime and its economic model based on cronyism. While visiting the Cogite incubator in Tunis, I was also inspired to learn of a group of Norwegian entrepreneurs who were developing an app to assist Syrian refugees learn Norwegian in order for them to integrate and find jobs in Norway. Norwegians in Tunisia are helping Syrians. That to me is the kind of world we want to live in. Young people — without heed to borders — applying their creativity to find solutions to a crisis of humanity. 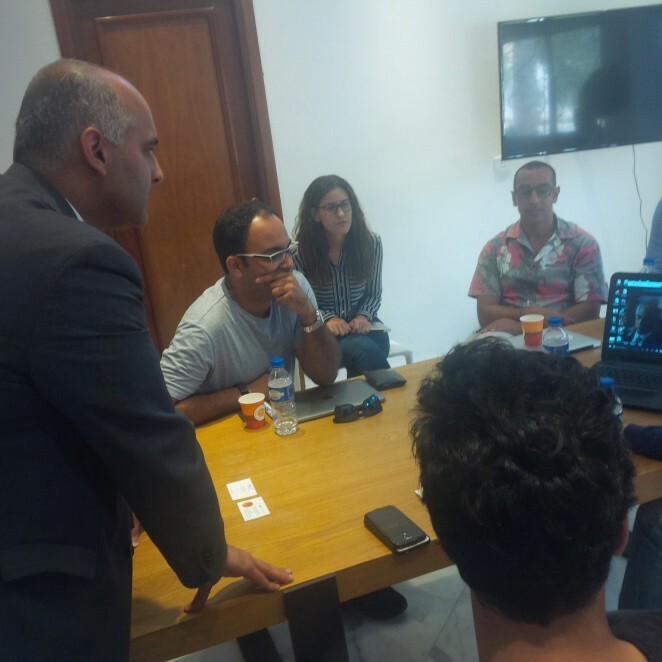 At Cogite, an incubator in Tunis, talking with young entrepreneurs about their tech innovations. But for my last stop on the Road to GES, I decided to come full circle to where it all began: Cairo. On June 1, I had the privilege to serve as the keynote speaker at a “Road to GES: Cairo” event at the American University in Cairo (AUC) that brought together 300 entrepreneurs. The day-long event featured networking opportunities and panels on investing in startups with venture capital firms, transformative technologies and resulting opportunities, and the socioeconomic impact entrepreneurs can have beyond their borders. Road to GES: Cairo event on June 1, 2016 at the American University in Cairo. In my remarks, I underscored the elements needed to create a successful entrepreneurial ecosystem: access to capital, protection of intellectual property, support from academic institutions, investment in infrastructure and technology, and a shift in a cultural mindset that accepts risk-taking and, failure. These are elements on which I have sought to build partnerships with foreign officials throughout my Road to GES stops. However, while the United States has a great deal to share, the fact is that we do not have a monopoly on entrepreneurship. Egypt has a rich history of entrepreneurism with enduring role models such as Talaat Harb — Egypt’s pioneer entrepreneur who went on to found the Bank of Egypt in 1907. Azza Faiad from Alexandria at the age of 20 years old tackled two of the world’s biggest issues at once — pollution and energy — when she discovered a more efficient way of converting garbage into valued biofuel. 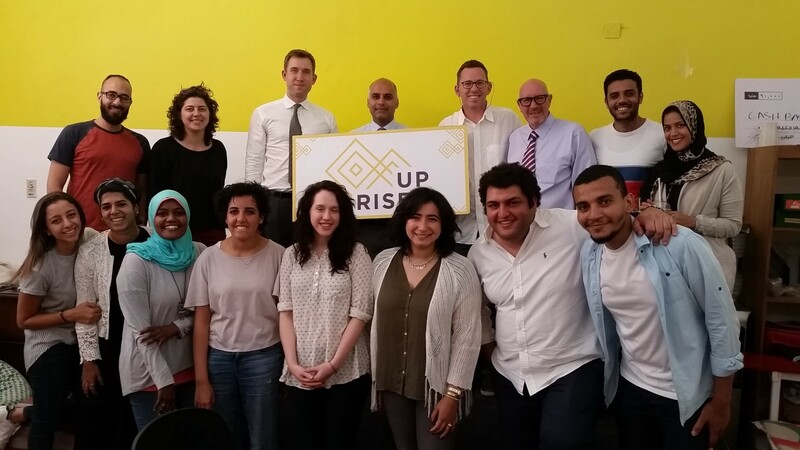 And then there is RiseUp Summit whose offices I visited at Cairo’s vibrant GrEEK campus. RiseUp organizes the MENA region’s preeminent summit on entrepreneurship with a total of 4,500 entrepreneurs in attendance last year. Event by event, they are forging an invaluable intra-regional ecosystem for entrepreneurs. Meeting with RiseUp Summit representatives at the GrEEK campus in Cairo. All that I have witnessed in Egypt and across my Road to GES stops is but a drop in the bucket. There is a world out there teeming with young innovators eager to create value and solutions in response to social needs, and who desire a platform to connect. GES is the preeminent platform for them to do so. Those that cannot attend GES can still plug into interact online with other entrepreneurs and investors. Special Representative for Commercial and Business Affairs at the U.S. Department of State.